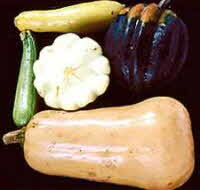 Squashes come in many different shapes and colors including tan, orange, and blue. There are many kinds of squashes (pumpkin, winter squash, summer squash, etc. ), all part of the genus Cucurbita (Family Cucurbitaceae). Squashes are one of the oldest known crops - 10,000 years by some estimates from sites in Mexico. Since squashes are gourds, they most likely served as containers or utensils because of their hard shells. The seeds and flesh later became an important part of the pre-Columbian Indian diet in both South and North America. De Soto, Coronado, and Cartier all saw “melons” (probably squash) in the Americas. The name "Squash" comes from the Narragansett Native American word 'askutasquash', which means "eaten raw or uncooked." Northeastern Native American tribes grew pumpkins, yellow crooknecks, patty pans, Boston marrows (perhaps the oldest squash in America still sold), and turbans. Southern tribes raised winter crooknecks, cushaws, and green and white striped sweet potato squashes. Native Americans roasted or boiled the squashes and pumpkins and preserved the flesh as conserves in syrup. They also ate the young shoots, leaves, flowers, and seeds. Virginia and New England settlers were not very impressed by the Indians’ squash until they had to survive the harsh winter, at which point they adopted squash and pumpkins as staples. Squashes were baked, cut and moistened with animal fat, maple syrup, and honey. Summer squash includes those varieties of squash that are harvested while still immature and when the entire squash is tender ad edible. They include the yellow Crockneck, the large yellow Straightneck, the greenish-white Patty Pan, and the slender green Zucchini and Italian Marrow. Some of these squash are available year-round. Winter squash are those varieties of squash which are marketed only when fully mature. Some of the most important varieties are the Acorn, butternut, Buttercup, Hubbard, Delicious and Banana. Winter squash are most plentiful from early fall until late winter.